The Turkish political landscape has been volatile for a while now and, especially in the past few years, we have witnessed dramatic transformations of Turkish state structures and institutions. The attempted coup of July 15th 2016 reinforced the significance and ongoing power of the Turkish military regardless of which political interests they are aligned with and it showed, once and again, the dangerous centrality of corrupt elite alliances in Erdogan’s ‘new Turkey’. More importantly, the 2016 coup attempt became a convenient pretext for massive crack-downs on heterogenous opposition to the government and it further instigated regime change through an emergency status referendum in 2017. 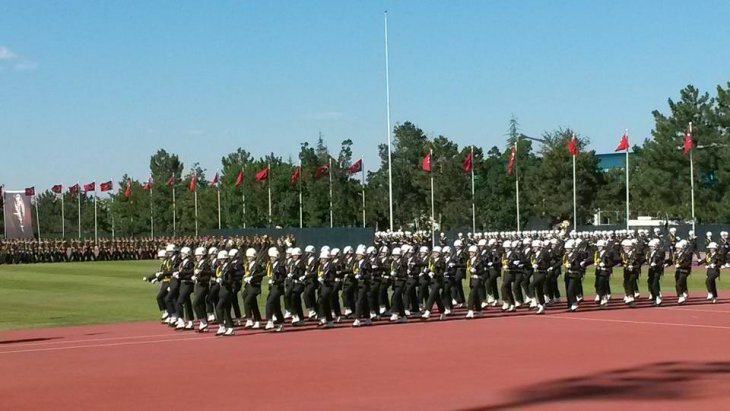 On the second anniversary of the coup attempt on July 15th 2018, the military itself became the target of radical structural reforms with an emergency decree placing the chief of General Staff and all force commanders under the Ministry of Defense. The decree also officially ended the de facto autonomy of the Turkish military, enjoyed by them since the early days of the republic. Regardless of their official status of autonomy however, the Turkish military has always been an extension and enabler of republican state ideology. This took different forms based on historically specific and fluid political dynamics. From the transition to parliamentary democracy in the 1950s and onwards, the military has loomed over civilian politics through a variety of coups and memorandums. At times the Turkish Military has been aligned with anti-Islamist, anti-leftist and anti-Kurdish political agendas, but has consistently espoused a Sunni Turkish nationalism in the shape of secularism. The question is: how did Turkey’s hawkish pashas now end up bowing to civilian authority in the shape of the AKP; and more importantly, what is the socio-cultural backdrop to this political shift? The answer can be found in the relatively recent history of Turkish civil-military relations- from the 1980s to the end of the 2000s- when the military defined the rise of political Islam as the top national security threat. During this era, a secularist military mobilized against Islamization by using not only the power of arms and tanks, but also through its institutional reach into the state apparatus to exert control over issues ranging from education, TV broadcasting, and business. In effect, the military securitized religion through large-scale threats of coups and memoranda, while at the same time micro-managing cultural symbols of Islamization in its security discourse and within its own ranks and bases. In its security discourse during this period, the Turkish military engaged in practices of identifying, expelling, or recuperating ‘Islamist infiltrators’ within the officers’ cadre; most of whom were identified through the headscarves of their wives and daughters. Based on an ethnographic study on military bases and in-depth interviews with the wives of military officers, my article in Security Dialogue examines the lived experience of the unique intertwinement of secularism with security through the concept of secular risk governance. Drawing on risk-based security studies that discuss risk as a form of social governance, I demonstrate the ways that a vaguely defined concept like ‘secularity’ ultimately determined the content and extent of Turkish security and political agendas, and gave meaning to notions of security and risk across a secular/religious epistemic divide. I further show how secular risk governance monitored the social life, daily conduct, and private realms of individuals by measuring ‘excess’ and ‘deviance’ against the backdrop of a normative modern and secular Sunni Muslim identity, where public representation of women’s bodies was key. My analysis also contributes to our understanding of how the populist secular/religious divide that looms over Turkish politics came into being as a self-fulfilling prophecy through the security framework enforced by the Turkish military. It throws light on a particularly crucial era of the authoritarian secularist security paradigm, which sowed the seeds of the AKP’s revanchist agenda and the increasingly sharpening ‘authoritarian turn’ after 2011 that began with a massive swing of authoritarian power from the Turkish military to the AKP. My analysis also considers civil-military relations since 2011 to make sense of how the military’s anti-Islamist security discourse paved the way for informal and illegal alliances and their subsequent disastrous collapse through the 2016 coup attempt. This case also offers important lessons in understanding the securitization of Muslims in Western security politics since 9/11. In the article, I point out how safety is practiced as secularity, parallel to the securitization of risky individuals who practice religion publicly in Western countries. This brings attention to future research on the security practices that govern our understanding of what being a ‘safe Muslim’ might mean according to secular norms. Approaching the securitization of Islam in Turkey through the concept of secular risk governance, my analysis bridges institutional and cultural mechanisms involved in security discourses and reveal how security happens through social relations and identities rather than solely through state-led military agendas.